Review:- I wasn’t sure what to expect when I bought this book, I’d spoken to Jess via twitter and I’d read the synopsis, it sounded like something I’d like. However I ate this book up, I devoured it whole. It is a fantastic read and I was lucky enough to go straight onto the sequel. Shiarra is a PI who gets fed up with being pushed around by mages, vampires, and almost anyone she encounters. She is pushed into a vampiric contract, signing her life away, and realises she is putting her life in jeopardy. So she decides to take her life back. This is a real page turner with lots of action and tension, with a great chunk of humour thrown in. We got to find out about Royce Chaz, who is very charming, powerful and a vamp. Shiarra is a strong, lovable character who grows throughout the novel. There is also the funny Sara who another great character in the book. 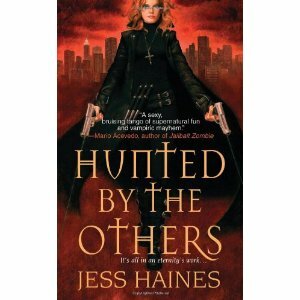 I am now hooked to Jess’s books, if you like Urban Fantasy this is for you. This book will keep you rooted to the spot until you finish it and leave you wanting more. A great and original urban fantasy read. I would recommend this to anyone into this genre. Disclaimer:- This is from my own collection and I decided to review it before reading the second which I got for review.